She has been known as the "kept woman," the "fancy woman," and the "other woman." She exists as both a fictional character and a flesh-and-blood human being. But what do Madame de Pompadour, Jane Eyre, and Camilla Parker-Bowles have in common? Why do women become mistresses, and is a mistress merely a wife-in-waiting, or is she the very definition of the emancipated, independent female? 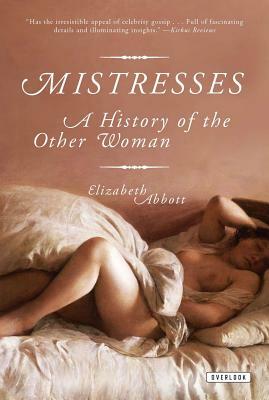 In "Mistresses," Elizabeth Abbott intelligently examines the motives and morals of some of the most infamous and fascinating women in history and literature. Drawing intimate portraits of those who have whether by chance, coercion, or choice assumed this complex role, from Chinese concubines and European royal mistresses to mobster molls and trophy girlfriends, "Mistresses" offers a rich blend of history, personal biography, and cultural insight. Elizabeth Abbott is Research Associate at Trinity College, University of Toronto, and, from 1991 to 2004, was Dean of Women. She is the author of several books, including "Sugar" and "Haiti," also published by Overlook.